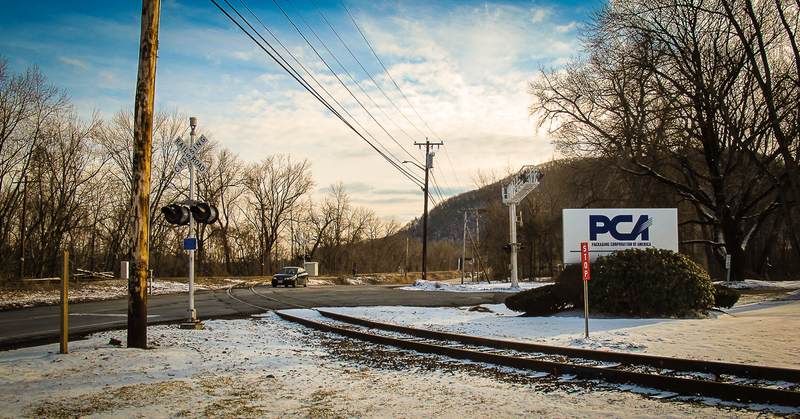 This unremarkable image shows the siding that leads from the Connecticut River Main Line into the Packaging Corporation of America (PCA) plant off of Mount Tom Road (U.S. Route 5) in Northampton. In the last few weeks, crews have installed flashing light signals on Mount Tom Road on both sides of this track. Additionally, a large cantilevered flashing light signal has been set up to warn vehicular traffic exiting the PCA site. Presumably, these active signals were mandated after a car drove into a Pan Am freight train on this track on October 6, 2015. At the time of the accident, this crossing had been protected by a set of passive signals known as crossbucks.